Our challenge at Crazy 4 Challenges this week is to be inspired by Rubber Ducky day! Who knew there was even such a thing? I’ve heard of some weird ‘holidays’ but really?? LOL!! Anyway, if you don’t have a ducky to use for your project, feel free to use another kind of fowl or bird. I had planned to make a baby card using a ducky stamp but when I pulled out a paper pad to use, I saw these lovely geese by Carta Bella! How perfect! I bought these Square Shaker dies from PTI a while a go but hadn’t used them yet. The scalloped frame is perfectly sweet! The goose paper was so cute I didn’t want to hide it so the shaker sits right on the patterned paper. It’s a little harder to build a shaker this way but I was careful to keep the shaker bits in the middle while I added the top. I added sequins and beads from several packets by Lucy’s Little Things. I do like to mix and match! I layered on some die cut words from Echo Park. After this, I looked back and decided I didn’t need anything else. Normally I’d add ribbon, Nuvo drops or some other small embellies. But with the busy design on the patterned paper, it looked fine as is. If you are looking for a challenge to join, pull out your bird stamps and get colouring! If you love to colour, be sure to also link up to Kathy Rascoosin’s 30 Day Colouring Challenge! Waltzing Mouse Stamps is having a blog hop for teachers! We still have at least 5 weeks worth of school here but I like having cards made ahead of time! 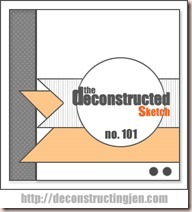 I’m also entering this in Deconstructing Sketches 101. I know this isn’t so teacher-y but I figure teachers are regular people too and probably get tired of teacher themed stuff. So I only added a subtle nod to a teacher theme with the printing practice lines paper. While making this I came up with a couple of tips. First, if you want to colour veneer shapes with mists, did you know you can just use the tip or side of the mister straw instead of getting out some sort of applicator or brush? I hate wasting product and even though it’s small, there is always some waste with an applicator. It worked perfectly and was quicker than I thought; I only dipped it in twice. Secondly, never sponge ink into your project with dirty scratch paper behind. You probably already know this but as I usually work with my paper in my hands, this didn’t dawn on me until the navy ink on my scratch paper started making my coral mist look very dirty. Bummer! Embellishment opportunity! Hello sequins! Last, I needed a colour of red I didn’t have. First I tried second generation stamping, not right. Then a technique I love which is to stamp a strong colour that’s too strong and stamp off, then add another colour of ink to the remaining ink and use the blended ink. While this technique rocks, the result was a bit too pale. I settled for a pure red then regretted it, too bright. I continued making my card but really wasn’t happy. Then I got the fabby idea to overstamp with Antique Linen Distress ink, a deep ivory colour, to darken and remove the brightness. I took a deep breath and prayed that I would be able to line it up, stamped and yeah! Not only did I line it up correctly but the colour was just right, nicely muted but not too dark! So consider these three tricks when you don’t have the right colour ink! Like my embellishment? I wrapped the butterfly with wire threaded with some cheap crystals. I don’t often use good ones for cards. Here’s how to get the wrap tight without using pliers to twist the wire tight (which will mar the antennae). 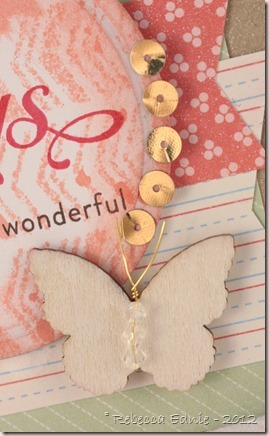 Fold the wire in half, thread with beads and place over the butterfly. Bring the front wire to the back and the back wire to the front keeping the wires straight. We aren’t going to twist the wires, just keep bring one wire to the front then the other, then one to the back then the other. The trick is to always start with the same wire and consistently work towards the same side otherwise you will twist and untwist the wire never getting anywhere. Enjoy the hop. Please visit again and feel free to sign up by email subscription if you’d like. I also have RSS feed but I think it’s the kind that’s ending soon so I have to look into getting a new one.